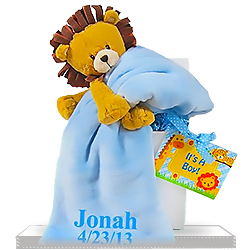 Spoil this baby boy right away with the super soft and fluffy Fattamano keepsake blanket that's been personalized! 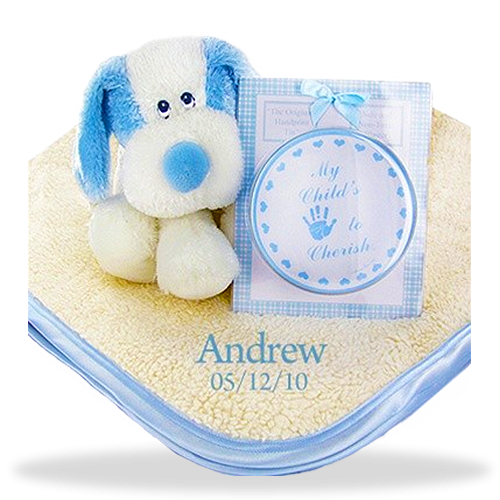 Also included is a blue and white plush puppy and a handprint set. What an extremely thoughtful gift on this big occasion! 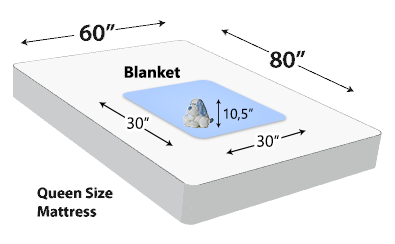 Travel Size 14" by 14"
Fattamano Luxury Baby Blanket Full Size: 30" by 30"
We Ship from OREGON ! 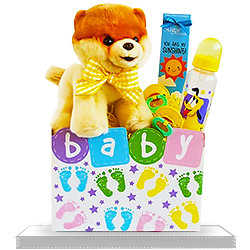 Same day shipping is available for Express gift baskets and gift sets if ordered by 10:00am PST. Provided they are NOT personalized. 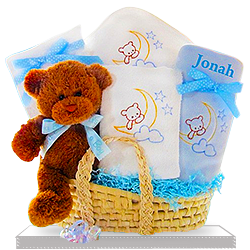 Diaper cakes MUST ship next day including all Express orders. 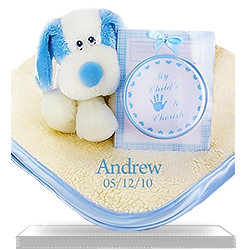 All other orders ship next day, when ordered by the close of the business day. Embroidered gifts take 2-3 days to process. *Please note that shipping days are business days and do not include weekends. 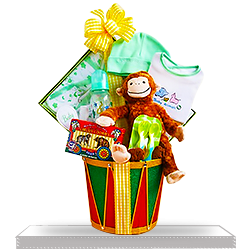 Do you want your gift basket to have that personal touch? 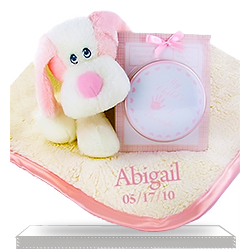 We can embroider the baby's name onto your gift basket, Blanket, Bib, Ribbon or Hat ! Please see item description for details about which items can be embroidered, and visit our FAQ for more information regarding this service. Please note, these services cost $10USD. Embroidered gifts take 2-3 days to process. 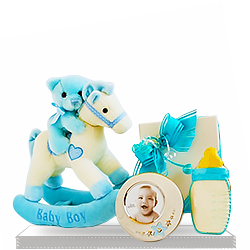 In my opinion babies deserve the best gifts and this gift set is surely one of the best. It was given to my son by a relative and was totally satisfied with everything. 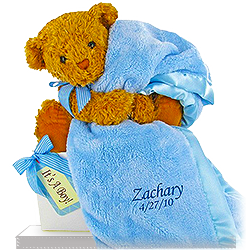 Now I’m ordering the same for my boss for her newborn boy. Absolutely sure she will appreciate it. If it wasn’t a gift for my only loved nephew I wouldn’t buy it for such price. I don’t regret buying this but will look for something cheaper when the recipient will be someone less precious for me.